Die Lunæ, 21° Maii 1832. Hamilton v. Bennet et al. Bp. Hereford takes the Oaths. Resolution that his Lordship hath made out his Claim. Gravesend Pier Bill, Tickner to attend. 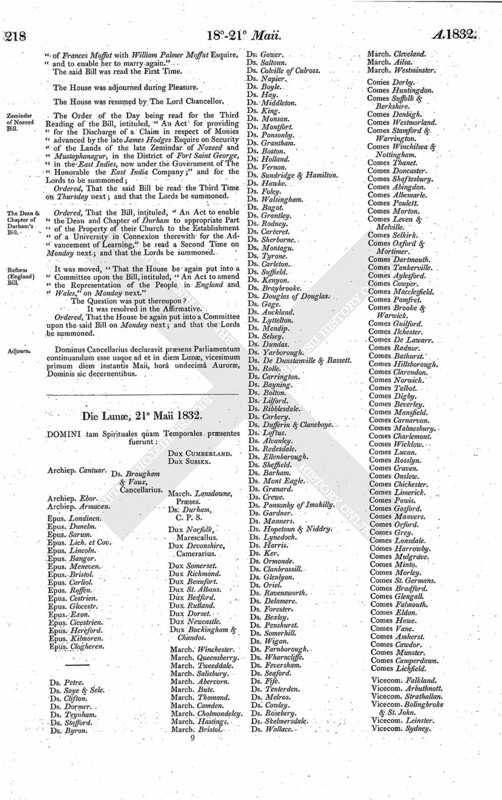 Slavery, Petition from Carmarthen for Abolition of. Petition of Marchss of Downshire respecting Assumption of Title of Earl of Stirling by A. H. Alexander, referred to same Com ee. Reform (England) Bill, Petition of J. Headlam that Northallerton may be the Place of Election. Hartlepool Pier Bill, Petition against. West India Colonies, Petition of Chamber of Commerce, Greenock, for Relief. Reform (England) Bill, Petition of Orange Lodge, No. 1672, against. Mills & Factories, Petition from Exeter for regulating Hours of Labour in. 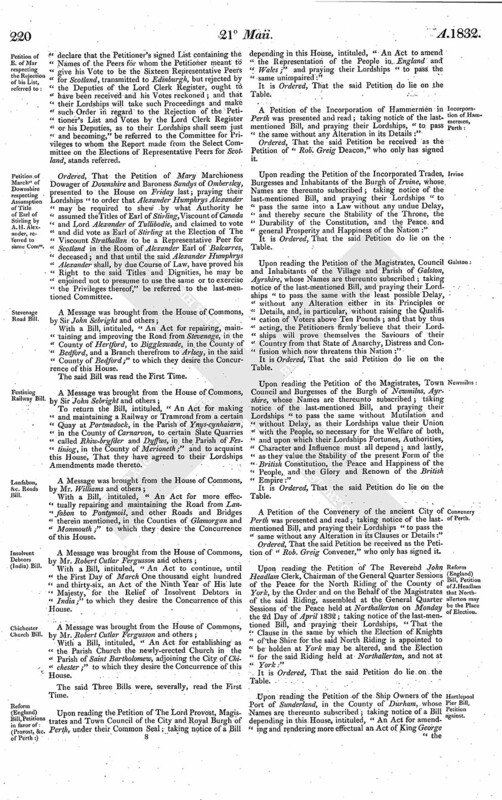 Reform (England) Bill, Petition of Mayor, &c. of Stockton that Stockton may return a Member. 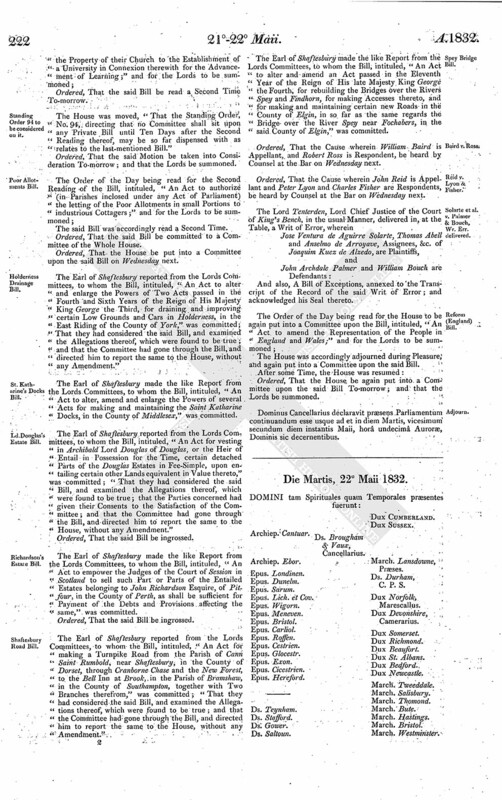 Reform (England) Bill, Petition of Dr. Jarvis that Margate may return a Member. Reform (England) Bill, Petition from Appleby to return one Member. Standing Order 94 to be considered on it. Reid v. Lyon & Fisher. Solarte et al. v. Palmer & Bouch, Wr. Err. delivered. Ds. Amesbury. March. Lansdowne, Præses. The Answer of The Reverend George Bennet and Mrs. Ann Hutton or Bennet his Spouse; Christian Agnes, Jane, Ann, Andrew and David Bennet, Children of the said Reverend George Bennet; Miss Christian Spittal, residing at Dysart, for herself and also as Executrix of the deceased Thomas Spittal, Ship Owner in Dysart; James Hutton, sometime Merchant in Dysart, now Accountant in London, and Andrew Scott, Writer to the Signet, his Mandatory; David Scott, Farmer at Northfield, Assignee of John Hutton, residing in Dysart; the said John Hutton and others, Executors and nearest of Kin of the deceased Christian Hutton Widow of the also deceased John Pert, Shipmaster in Dysart; Mrs. Charlotte Dundas or Davies, Wife of Hart Davies Esquire, Commissioner of Excise in London, and said Hart Davies for his Interest; Battersly as in right of Mrs. Elizabeth Grey Dundas or Battersly his Wife, now deceased; Mrs. Amelia Strachan or Richards, Wife of Richards Esquire, and said Richards for his Interest; and Catherine Strachan or Carr, Wife of Carr, and the said Carr for his Interest, Respondents, to the Petition and Appeal of John Hamilton, Writer to the Signet, common Agent appointed by the Court of Session in the Process of Ranking and Sale of the Lands of Gairdoch and others, belonging to the late John Ogilvie Esquire, Appellant, was this Day brought in. Charles Dundas Esquire, being, by Letters Patent bearing Date the 16th Day of May, in the Second Year of the Reign of His present Majesty, created Baron Amesbury of Kintbury, Amesbury and Barton Court, in the County of Berks, and of Aston Hall, in the County of Flint, with Remainder to the Heirs Male of his Body, was (in his Robes) introduced between The Lord Braybrooke and The Lord Dundas, (also in their Robes,) the Yeoman Usher of the Black Rod, Garter King of Arms and the Earl Marshal preceding: His Lordship, on his Knee, presented his Patent to The Lord Chancellor at the Woolsack, who delivered it to the Clerk, and the same was read at the Table. "William the Fourth, by the Grace of God, of the United Kingdom of Great Britain and Ireland, King, Defender of the Faith; To Our right trusty and wellbeloved Charles Dundas of Kintbury, Amesbury and Barton Court, in Our County of Berks, and of Aston Hall, in Our County of Flint, Chevalier, Greeting: Whereas Our Parliament, for arduous and urgent Affairs concerning Us, the State and Defence of Our United Kingdom of Great Britain and Ireland, and the Church, is now met at Our City of Westminster; We, strictly enjoining, command you, under the Faith and Allegiance by which you are bound to Us, that considering the Difficulty of the said Affairs and Dangers impending, all Excuses being laid aside, you be personally present at Our aforesaid Parliament with Us, and with the Prelates, Nobles and Peers of Our said Kingdom, to treat of the aforesaid Affairs, and to give your Advice; and this you may in nowise omit as you tender Us and Our Honour, and the Safety and Defence of the said Kingdom and Church, and the Dispatch of the said Affairs. "Witness Ourself at Westminster, the Sixteenth Day of May, in the Second Year of Our Reign. Then his Lordship, at the Table, took the Oaths, and also took and subscribed the Oath of Abjuration, pursuant to the Statues; and was afterwards placed on the lower End of the Barons Bench. This Day Edward Lord Bishop of Hereford took the Oaths, and also took and subscribed the Oath of Abjuration, pursuant to the Statutes. "Resolved, That it is the Opinion of this Committee, That Henry de la Poer Marquess of Waterford, of that Part of the United Kingdom called Ireland, hath made out his Claim to be admitted, as a Temporal Peer of Ireland, to vote at the Election of the Lords Temporal to represent the Peerage of Ireland in the Parliament of the United Kingdom." 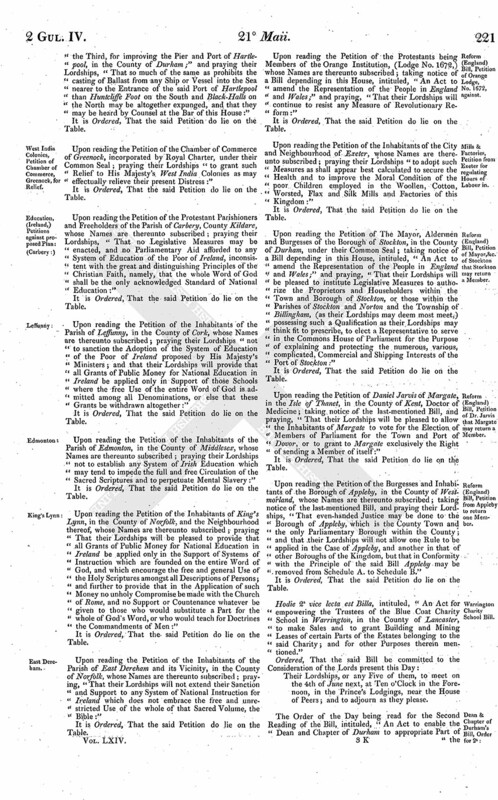 Resolved and Adjudged, by the Lords Spiritual and Temporal, in Parliament assembled, That Henry de la Poer Marquess of Waterford of that Part of the United Kingdom called Ireland, hath made out his Claim to be admitted, as a Temporal Peer of Ireland, to vote at the Election of the Lords Temporal to represent the Peerage of Ireland in the Parliament of the United Kingdom. Ordered, That the Clerk of the Parliaments do transmit to the Clerk of the Crown in Ireland the said Resolution and Judgment. The House being informed, "That Mr. Pickering, from the Trustees of the Liverpool Docks, attended;"
An Account of the Receipt and Disbursement of the Dock and Light Duties at the Port of Liverpool, from the 25th June 1830 to the 24th June 1831." Ordered, That Edward Tickner do attend this House forthwith, to be sworn, in order to his being examined as a Witness before the Committee to whom the Bill, intituled, "An Act for amending an Act passed in the Ninth Year of the Reign of His late Majesty King George the Fouth, intituled, "An Act for rebuilding, or for improving, regulating and maintaining the Town Quay of Gravesend, in the County of Kent, and the Landing Place belonging thereto;" and for building a Pier or Jetty adjoining thereto; and for other Purposes connected therewith," stands committed. Upon reading the Petition of the Burgesses and Inhabitants of the County of the Borough of Carmarthen, whose Names are thereunto subscribed; praying, "That their Lordships will pass a Law at the earliest Period for the speedy and entire Abolition of Slavery in the British Colonies:"
Ordered, That the Petition of John Francis Miller Earl of Mar, presented to the House on the 23d of August last; praying their Lordships "to find and declare that the Petitioner's signed List containing the Names of the Peers for whom the Petitioner meant to give his Vote to be the Sixteen Representative Peers for Scotland, transmitted to Edinburgh, but rejected by the Deputies of the Lord Clerk Register, ought to have been received and his Votes reckoned; and that their Lordships will take such Proceedings and make such Order in regard to the Rejection of the Petitioner's List and Votes by the Lord Clerk Register or his Deputies, as to their Lordships shall seem just and becoming," be referred to the Committee for Privileges to whom the Report made from the Select Committee on the Elections of Representative Peers for Scotland, stands referred. Ordered, That the Petition of Mary Marchioness Dowager of Downshire and Baroness Sandys of Ombersley, presented to the House on Friday last; praying their Lordships "to order that Alexander Humphrys Alexander may be required to shew by what Authority he assumed the Titles of Earl of Stirling, Viscount of Canada and Lord Alexander of Tullibodie, and claimed to vote and did vote as Earl of Stirling at the Election of The Viscount Strathallan to be a Representative Peer for Scotland in the Room of Alexander Earl of Balcarres, deceased; and that until the said Alexander Humphrys Alexander shall, by due Course of Law, have proved his Right to the said Titles and Dignities, he may be enjoined not to presume to use the same or to exercise the Privileges thereof," be referred to the last-mentioned Committee. With a Bill, intituled, "An Act for repairing, maintaining and improving the Road from Stevenage, in the County of Hertford, to Biggleswade, in the County of Bedford, and a Branch therefrom to Arlsey, in the said County of Bedford;" to which they desire the Concurrence of this House. To return the Bill, intituled, "An Act for making and maintaining a Railway or Tramroad from a certain Quay at Portmadock, in the Parish of Ynys-cynhaiarn, in the County of Carnarvon, to certain Slate Quarries called Rhiw-bryfder and Dyffws, in the Parish of Festiniog, in the County of Merioneth;" and to acquaint this House, That they have agreed to their Lordships Amendments made thereto. With a Bill, intituled, "An Act for more effectually repairing and maintaining the Road from Lanfabon to Pontymoil, and other Roads and Bridges therein mentioned, in the Counties of Glamorgan and Monmouth;" to which they desire the Concurrence of this House. With a Bill, intituled, "An Act to continue, until the First Day of March One thousand eight hundred and thirty-six, an Act of the Ninth Year of His late Majesty, for the Relief of Insolvent Debtors in India;" to which they desire the Concurrence of this House. With a Bill, intituled, "An Act for establishing as the Parish Church the newly-erected Church in the Parish of Saint Bartholomew, adjoining the City of Chichester;" to which they desire the Concurrence of this House. Upon reading the Petition of The Lord Provost, Magistrates and Town Council of the City and Royal Burgh of Perth, under their Common Seal; taking notice of a Bill depending in this House, intituled, "An Act to amend the Representation of the People in England and Wales;" and praying their Lordships "to pass the same unimpaired:"
A Petition of the Incorporation of Hammermen in Perth was presented and read; taking notice of the lastmentioned Bill, and praying their Lordships, "to pass the same without any Alteration in its Details:"
Ordered, That the said Petition be received as the Petition of "Rob. Greig Deacon," who only has signed it. 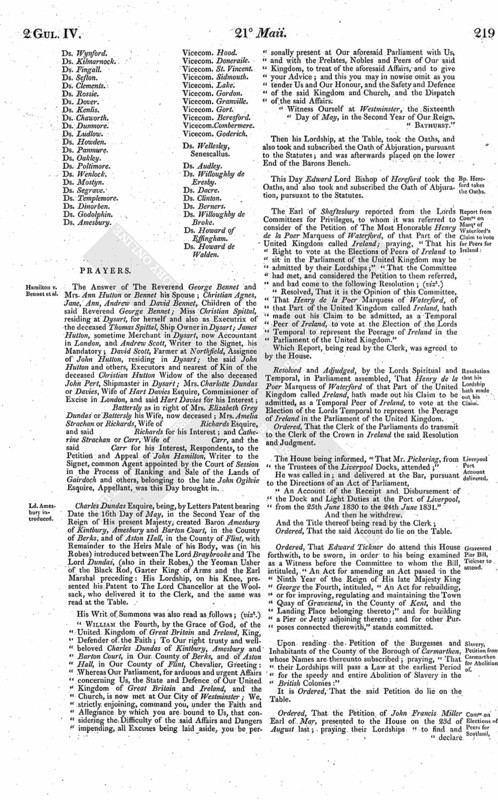 Upon reading the Petition of the Incorporated Trades, Burgesses and Inhabitants of the Burgh of Irvine, whose Names are thereunto subscribed; taking notice of the last-mentioned Bill, and praying their Lordships "to pass the same into a Law without any undue Delay, and thereby secure the Stability of the Throne, the Durability of the Constitution, and the Peace and general Prosperity and Happiness of the Nation:"
Upon reading the Petition of the Magistrates, Council and Inhabitants of the Village and Parish of Galston, Ayrshire, whose Names are thereunto subscribed; taking notice of the last-mentioned Bill, and praying their Lordships "to pass the same with the least possible Delay, without any Alteration either in its Principles or Details, and, in particular, without raising the Qualification of Voters above Ten Pounds; and that by thus acting, the Petitioners firmly believe that their Lordships will prove themselves the Saviours of their Country from that State of Anarchy, Distress and Confusion which now threatens this Nation:"
Upon reading the Petition of the Magistrates, Town Council and Burgesses of the Burgh of Newmilns, Ayrshire, whose Names are thereunto subscribed; taking notice of the last-mentioned Bill, and praying their Lordships "to pass the same without Mutilation and without Delay, as their Lordships value their Union with the People, so necessary for the Welfare of both, and upon which their Lordships Fortunes, Authorities, Character and Influence must all depend; and lastly, as they value the Stability of the present Form of the British Constitution, the Peace and Happiness of the People, and the Glory and Renown of the British Empire:"
A Petition of the Convenery of the ancient City of Perth was presented and read; taking notice of the lastmentioned Bill, and praying their Lordships "to pass the same without any Alteration in its Clauses or Details:"
Ordered, That the said Petition be received as the Petition of "Rob. Greig Convener," who only has signed it. Upon reading the Petition of The Reverend John Headlam Clerk, Chairman of the General Quarter Sessions of the Peace for the North Riding of the County of York, by the Order and on the Behalf of the Magistrates of the said Riding, assembled at the General Quarter Sessions of the Peace held at Northallerton on Monday the 2d Day of April 1832; taking notice of the last-mentioned Bill, and praying their Lordships, "That the Clause in the same by which the Election of Knights of the Shire for the said North Riding is appointed to be holden at York may be altered, and the Election for the said Riding held at Northallerton, and not at York:"
Upon reading the Petition of the Ship Owners of the Port of Sunderland, in the County of Durham, whose Names are thereunto subscribed; taking notice of a Bill depending in this House, intituled, "An Act for amending and rendering more effectual an Act of King George the Third, for improving the Pier and Port of Hartlepool, in the County of Durham;" and praying their Lordships, "That so much of the same as prohibits the casting of Ballast from any Ship or Vessel into the Sea nearer to the Entrance of the said Port of Hartlepool than Huntcliffe Foot on the South and Black-Halls on the North may be altogether expunged, and that they may be heard by Counsel at the Bar of this House:"
Upon reading the Petition of the Chamber of Commerce of Greenock, incorporated by Royal Charter, under their Common Seal; praying their Lordships "to grant such Relief to His Majesty's West India Colonies as may effectually relieve their present Distress:"
Upon reading the Petition of the Protestant Parishioners and Freeholders of the Parish of Carbery, County Kildare, whose Names are thereunto subscribed; praying their Lordships, "That no Legislative Measures may be enacted, and no Parliamentary Aid afforded to any System of Education of the Poor of Ireland, inconsistent with the great and distinguishing Principles of the Christian Faith, namely, that the whole Word of God shall be the only acknowledged Standard of National Education:"
Upon reading the Petition of the Inhabitants of the Parish of Leffunny, in the County of Cork, whose Names are thereunto subscrbed; praying their Lordships "not to sanction the Adoption of the System of Education of the Poor of Ireland proposed by His Majesty's Ministers; and that their Lordships will provide that all Grants of Public Money for National Education in Ireland be applied only in Support of those Schools where the free Use of the entire Word of God is admitted among all Denominations, or else that these Grants be withdrawn altogether:"
Upon reading the Petition of the Inhabitants of the Parish of Edmonton, in the County of Middlesex, whose Names are thereunto subscribed; praying their Lordships not to establish any System of Irish Education which may tend to impede the full and free Circulation of the Sacred Scriptures and to perpetuate Mental Slavery:"
Upon reading the Petition of the Inhabitants of King's Lynn, in the County of Norfolk, and the Neighbourhood thereof, whose Names are thereunto subscribed; praying That their Lordships will be pleased to provide that all Grants of Public Money for National Education in Ireland be applied only in the Support of Systems of Instruction which are founded on the entire Word of God, and which encourage the free and general Use of the Holy Scriptures amongst all Descriptions of Persons; and further to provide that in the Application of such Money no unholy Compromise be made with the Church of Rome, and no Support or Countenance whatever be given to those who would substitute a Part for the whole of God's Word, or who would teach for Doctrines the Commandments of Men:"
Upon reading the Petition of the Inhabitants of the Parish of East Dereham and its Vicinity, in the County of Norfolk, whose Names are thereunto subscribed; praying, "That their Lordships will not extend their Sanction and Support to any System of National Instruction for Ireland which does not embrace the free and unrestricted Use of the whole of that Sacred Volume, the Bible:"
Upon reading the Petition of the Protestants being Members of the Orange Institution, (Lodge No. 1672,) whose Names are thereunto subscribed; taking notice of a Bill depending in this House, intituled, "An Act to amend the Representation of the People in England and Wales;" and praying, "That their Lordships will continue to resist any Measure of Revolutionary Reform:"
Upon reading the Petition of the Inhabitants of the City and Neighbourhood of Exeter, whose Names are thereunto subscribed; praying their Lordships "to adopt such Measures as shall appear best calculated to secure the Health and to improve the Moral Condition of the poor Children employed in the Woollen, Cotton, Worsted, Flax and Silk Mills and Factories of this Kingdom:"
Upon reading the Petition of The Mayor, Aldermen and Burgesses of the Borough of Stockton, in the County of Durham, under their Common Seal; taking notice of a Bill depending in this House, intituled, "An Act to amend the Representation of the People in England and Wales;" and praying, "That their Lordships will be pleased to institute Legislative Measures to authorize the Proprietors and Householders within the Town and Borough of Stockton, or those within the Parishes of Stockton and Norton and the Township of Billingham, (as their Lordships may deem most meet,) possessing such a Qualification as their Lordships may think fit to prescribe, to elect a Representative to serve in the Commons House of Parliament for the Purpose of explaining and protecting the numerous, various, complicated, Commercial and Shipping Interests of the Port of Stockton:"
Upon reading the Petition of Daniel Jarvis of Margate, in the Isle of Thanet, in the County of Kent, Doctor of Medicine; taking notice of the last-mentioned Bill, and praying, "That their Lordships will be pleased to allow the Inhabitants of Margate to vote for the Election of Members of Parliament for the Town and Port of Dovor, or to grant to Margate exclusively the Right of sending a Member of itself:"
Upon reading the Petition of the Burgesses and Inhabitants of the Borough of Appleby, in the County of Westmorland, whose Names are thereunto subscribed; taking notice of the last-mentioned Bill, and praying their Lordships, "That even-handed Justice may be done to the Borough of Appleby, which is the County Town and the only Parliamentary Borough within the County; and that their Lordships will not allow one Rule to be applied in the Case of Appleby, and another in that of other Boroughs of the Kingdom, but that in Conformity with the Principle of the said Bill Appleby may be removed from Schedule A. to Schedule B." Hodie2a vice lecta est Billa, intituled, "An Act for empowering the Trustees of the Blue Coat Charity School in Warrington, in the County of Lancaster, to make Sales and to grant Building and Mining Leases of certain Parts of the Estates belonging to the said Charity; and for other Purposes therein mentioned." Their Lordships, or any Five of them, to meet on the 4th of June next, at Ten o'Clock in the Forenoon, in the Prince's Lodgings, near the House of Peers; and to adjourn as they please. Ordered, That the said Bill be read a Second Time To-morrow. The House was moved, "That the Standing Order, No. 94, directing that no Committee shall sit upon any Private Bill until Ten Days after the Second Reading thereof, may be so far dispensed with as relates to the last-mentioned Bill." Ordered, That the said Motion be taken into Consideration To-morrow; and that the Lords be summoned. Ordered, That the House be put into a Committee upon the said Bill on Wednesday next. The Earl of Shaftesbury reported from the Lords Committees, to whom the Bill, intituled, "An Act to alter and enlarge the Powers of Two Acts passed in the Fourth and Sixth Years of the Reign of His Majesty King George the Third, for draining and improving certain Low Grounds and Cars in Holderness, in the East Riding of the County of York," was committed; That they had considered the said Bill, and examined the Allegations thereof, which were found to be true; and that the Committee had gone through the Bill, and directed him to report the same to the House, without any Amendment." The Earl of Shaftesbury made the like Report from the Lords Committees, to whom the Bill, intituled, "An Act to alter, amend and enlarge the Powers of several Acts for making and maintaining the Saint Katharine Docks, in the County of Middlesex," was committed. The Earl of Shaftesbury reported from the Lords Committees, to whom the Bill, intituled, "An Act for vesting in Archibald Lord Douglas of Douglas, or the Heir of Entail in Possession for the Time, certain detached Parts of the Douglas Estates in Fee-Simple, upon entailing certain other Lands equivalent in Value thereto," was committed; "That they had considered the said Bill, and examined the Allegations thereof, which were found to be true; that the Parties concerned had given their Consents to the Satisfaction of the Committee; and that the Committee had gone through the Bill, and directed him to report the same to the House, without any Amendment." Ordered, That the said Bill be ingrossed. The Earl of Shaftesbury made the like Report from the Lords Committees, to whom the Bill, intituled, "An Act to empower the Judges of the Court of Session in Scotland to sell such Part or Parts of the Entailed Estates belonging to John Richardson Esquire, of Pitfour, in the County of Perth, as shall be sufficient for Payment of the Debts and Provisions affecting the same," was committed. The Earl of Shaftesbury reported from the Lords Committees, to whom the Bill, intituled, "An Act for making a Turnpike Road from the Parish of Cann Saint Rumbold, near Shaftesbury, in the County of Dorset, through Cranborne Chase and the New Forest, to the Bell Inn at Brook, in the Parish of Bramshaw, in the County of Southampton, together with Two Branches therefrom," was committed; "That they had considered the said Bill, and examined the Allegations thereof, which were found to be true; and that the Committee had gone through the Bill, and directed him to report the same to the House, without any Amendment." The Earl of Shaftesbury made the like Report from the Lords Committees, to whom the Bill, intituled, "An Act to alter and amend an Act passed in the Eleventh Year of the Reign of His late Majesty King George the Fourth, for rebuilding the Bridges over the Rivers Spey and Findhorn, for making Accesses thereto, and for making and maintaining certain new Roads in the County of Elgin, in so far as the same regards the Bridge over the River Spey near Fochabers, in the said County of Elgin," was committed. Ordered, That the Cause wherein William Baird is Appellant, and Robert Ross is Respondent, be heard by Counsel at the Bar on Wednesday next. Ordered, That the Cause wherein John Reid is Appellant and Peter Lyon and Charles Fisher are Respondents, be heard by Counsel at the Bar on Wednesday next. And also, A Bill of Exceptions, annexed to the Transcript of the Record of the said Writ of Error; and acknowledged his Seal thereto. Ordered, That the House be again put into a Committee upon the said Bill To-morrow; and that the Lords be summoned. Dominus Cancellarius declaravit præsens Parliamentum continuandum esse usque ad et in diem Martis, vicesimum secundum diem instantis Maii, horâ undecimâ Auroræ, Dominis sic decernentibus.